Biking the island, eating pie, listening to live music — if this all sounds good to you, you’ll want to listen here as Demi Allen of Squeaky Wheels tells BCB host Kayla Black about this year’s Bike for Pie. Squeaky Wheels is a bicycle advocacy organization founded in 1994 by a group of Bainbridge Island bicyclists concerned about bicycle safety and access on the island. Squeaky Wheels is an all-volunteer non-profit organization whose purpose is to educate, promote, and support all aspects of bicycle usage on the island. The group’s signature event, held annually in August, is Bike for Pie. This laid back family-friendly ride is open to all ages: just sign up, come to Waterfront Park, then travel your assigned route out and back to Waterfront Park for an afternoon of pie-eating and listening to the stirring sounds of Mud Junket. 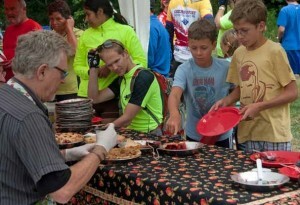 There are two bike routes: a 32-mile Challenge Course and an 8-mile Family Course. 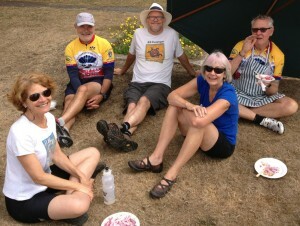 The Challenge route includes a savory pie stop provided by Friends of the Farm, and there will be sweet pies for all at the end of both rides. 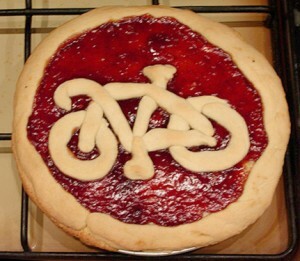 Visit www.squeakywheels.org/events/bike-for-pie.html for more information and to register for the event. If you’d like to volunteer to help with this or other events, come to a meeting: Squeaky Wheels meets every 3rd Thursday, 6:30 pm at the Marge Williams Center, 221 Winslow Way W. #307. Credits: Host: Kayla Black; Studio Tech/Editor: Lyssa Danehy deHart; BCB ferry music by Dogfish Bay Studios; What’s Up music splash: Dave Bristow; podcast art: artopia creative.